Read the FULL eligibility critera in the National Person Specification from the National Recruitment Office site. Multi Specialty Recruitment Assessment (formerly known as Stage 2) is a computer based exam comprising both clinical and professional dilemma multiple choice questions. – Professional dilemma paper – 58 Situational Judgement Test questions in 110 minutes. These questions are in 2 formats – ranking SJTs and multiple selection SJTs – they test professional attributes, judgement and decision making. You can download the official SRA sample questions from the National Recruitment Office to get an idea of the type of question in each paper. Candidates will be shortlisted to Stage 3 based on how they score in the SRA – the application, past experience, additional qualifications are not considered. If you score 575+ combined, you will be exempt the next stage and given a direct offer. Selection Centre (formerly known as Stage 3) involves 3 simulated consultations (1 with a simulated patient, 1 with a relative or carer and 1 with a colleague) and a written prioritisation exercise (essay style question). You can download the official stage 3 sample cases / questions from the NRO to see examples of the type of thing to expect. Round 1 – applications open in autumn/winter (November/December) for jobs starting the following August. The SRA is usually first week of January, with the Selection Centre taking place in the first 2 weeks of February. Round 1 Re-advert – applications open in the spring (March/April) for jobs starting in August the same year. The SRA is usually late April with the Selection Centre in early May. This used to be known as Round 2. Round 2 – applications open in August for jobs starting the following February. The SRA is in mid-September and the Selection Centre about 2 weeks later. This was previously known as Round 3. 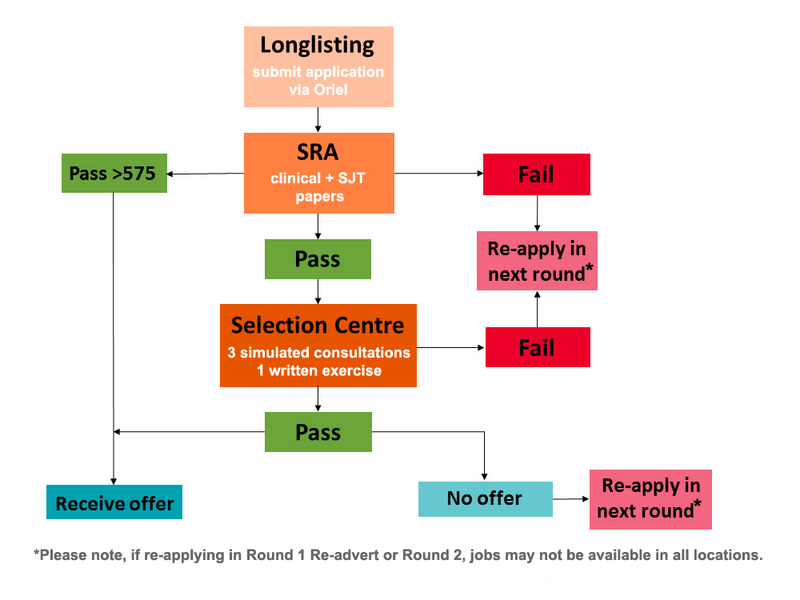 Jobs that are unfilled from Round 1 are available in Round 1 Re-advert for both new applicants and those who applied in Round 1 but were unsuccessful. All jobs start in August. The jobs available in Round 2 are jobs unfilled by the previous two rounds of recruitment – jobs start in February. Enter your email address to subscribe to this blog and receive notifications of new posts relating to GP training by email.